British Colonel Katherine Powell (Helen Mirren) is ready to pull the trigger, but the trigger is not on the ground in Nairobi but in a small, safe office on the other side of the world in Las Vegas. She has calculated the military risks and with steel-eyed determination is confident that they have to take this opportunity to take out the terrorists even if an innocent little girl is caught in the blast radius. American pilot Steve Watts (Aaron Paul) is piloting the drone and he’s the one that has to pull the trigger. He sees the little girl and he’s not ready to accept Col. Powell at her word. He has put a face to the damage that he personally is about to cause. 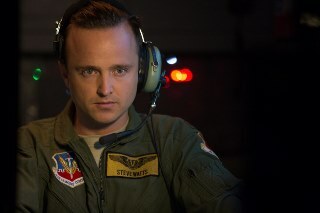 Aaron Paul is Steve Watts in EYE IN THE SKY, an Entertainment One release. Meanwhile Lieutenant General Frank Benson (Alan Rickman) is the military-political go-between. He has to express the military risks and considerations to politicians who are then weighing the possible outcomes, a percentage-chance death of one innocent girl, versus a not yet materialized terrorist attack with guaranteed deaths of hundreds. Eye in the Sky will make you think, and what I appreciated most about this approach is that I got to consider points of view in this complicated matter that I otherwise wouldn’t have thought about. Paul speaks the most directly to the audience. His serious dilemma weighs clearly on him and the empathy that he shares with his co-pilot Carrie Gershon (Phoebe Fox) is what the audience is begging for our military and political leaders to have. This also leads to a powerful twist (not twist plot-wise but character-wise) near the end where Alan Rickman delivers a monologue to anyone who ever dared to think that those in his position didn’t get there without witnessing unbearable tragedies. Last but not least, Barkhad Abdi appears as a Kenyan personnel on the ground. He has to fight for his life as well as the life of the little girl. Let that serve as a final reason to see this smart, thought-provoking thriller.